It is hard to imagine a society so disillusioned it could be seduced by a character like Jim Jones – and hard to believe someone could be as charismatic as he obviously was. In order to write Beautiful Revolutionary, Laura Elizabeth Woollett spent years researching the Jonestown massacre. She interviewed surviving members of the People’s Temple and the families of those who died, creating an in-depth portrait of an era and one of its most extreme manifestations. The narrative unfolds principally through the eyes of Evelyn and Lenny, young newly married pacifists who escape the draft by working in a country mental hospital. Isolated in small-town California, they come into the orbit of the Reverend Jim Jones and his People’s Temple. With his vision of an egalitarian, racially integrated community, Evelyn, in particular, is seduced by the charms of the evangelical preacher and finds her calling in his temple and his bed. Within the congregation there is a feverish adoration of Jim Jones ‘The Father’, and he exploits this ruthlessly. With an uncanny insight into his followers vulnerabilities, he micromanages their lives and requires proof of loyalty in the form of increasingly bizarre sexual demands. As the community grows so does Jones’ megalomania and paranoia, culminating in his decision to move to Guyana. Here, supposedly isolated from the corrupting influences of their families and the decadent capitalism of the United States, the story moves inexorably towards the grisly climax of the Jonestown massacre – forty years ago this year. I’m not sure Woollett entirely convinces us of Jones’ appeal but she certainly furnishes us with a portrait of a fabulous narcissist. Jones never waivers in his sense of self-belief despite the Machiavellian lengths he has to go to in order to maintain control – he even manages to use his brazen sexual exploitation of the congregation as a sign of his altruism and self-sacrifice. 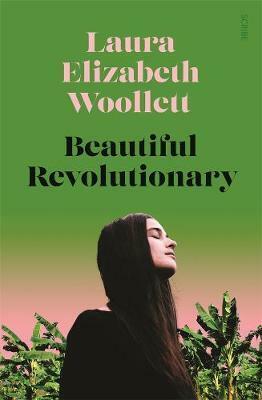 Beautiful Revolutionary is perfect for fans of Emma Cline’s The Girls and The Family by Chris Johnston and Rosie Jones. Susan Stevenson works as a bookseller at Readings Malvern.